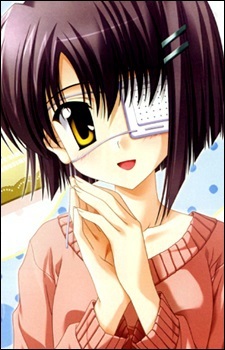 Chihiro is the younger twin sister of Kei Shindo from Ef: The First Tale. and the main heroine of the third chapter in the story. Despite them being mutually shy, Renji comes back to see her at the station every day after school and quickly becomes friends with her. She loves to read novels. Renji later learns that she has a severe case of anterograde amnesia where she cannot remember anything past thirteen hours previous, aside from the events before the accident which she can recall perfectly. When she was younger, she was involved in an accident which resulted in her condition, and now carries a diary with her which she writes in every day the events of that day so that the next day, after she had forgotten everything, she will be able to remind herself of what happened the previous day. Ironically, she has a fantastic memory of anything that happened that is less than thirteen hours old. Renji loves to read novels, and after discussing it with Chihiro, he collaborates with her to see if he can finally make her dream of writing a book come true. Through the process of writing the novel, the two eventually become very close and they fall in love with each other. As the story progresses and more of the novel is written, Renji soon discovers that the novel is an allegory for Chihiro's life and how she sees the world around her due to the state of her limited memory.